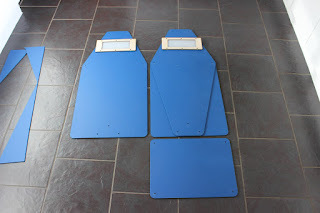 The laser upgrade went remarkably smoothly and the laser cutter was functional but there were a few minor changes and improvements that needed to be done. Fixing the screen image The first and most noticeable tweak for my new Ruida system was to fix the screen display. Most of my cuts are symmetrical so it was a day or two before I noticed that the image on the screen was mirrored. The laser cutter was cutting the correct way so I knew this had to be a simple setting on the controller. 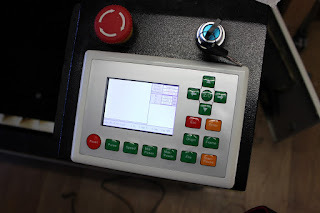 In the menu system is an option called 'Screen Origin' we have to set this to 'Top Right' so that the controller knows it's cutting from the same corner as the laser. Since I recently upgrade to a ruida controller I figured I should sell the spare parts that I no longer need, a second security dongle is always handy or a brand new control panel should your buttons be wearing out. 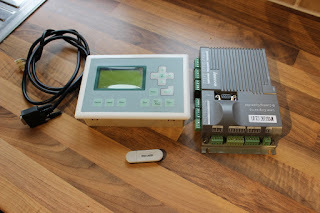 Finally I'm listing a complete Leetro system, sure the ruida controller is better than the leetro system but if you've got a limited budget then you can snag a bargain and any kind of DSP controller would be an improvement for a K40. 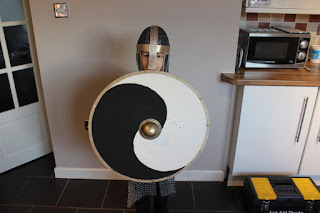 To go with the saxon helmet we made a super simple shield. It's literally just a circle of 3mm birch with a handle cut through the middle. I had a vacuum formed shield boss left over from the roman shield we made previously. The details were just drawn on with low power lines which made it easy for Eli to paint. He even got to wear my chain mail shirt to finish the look off. 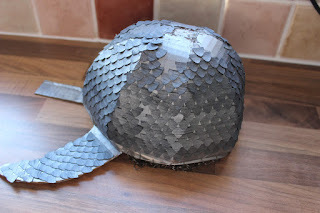 Homework last week was to build a helmet for the school battle reenactment. We joined a few strips front to back, left to right and around the circumference, filled in the quarters and then covered it all in cardboard scales. We cut a whole sheet of scales on the laser and painted them metallic silver, leaving them all connected at the top made them easy to apply to the helmet.